While crustaceans are a commercially and ecologically valuable group of species in the northeastern U.S., few studies have been conducted to date to investigate how they might respond to ocean and coastal acidification. 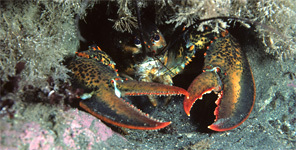 To date, only two studies have investigated the potential efffects of ocean and coastal acidification on the American lobster (Homarus americanus). Both studies were conducted in the laboratory, not in the real-world environment. One study found a negative impact on lobster larvae exposed to acidified seawater, as the larvae had smaller carapaces (Keppel et al. 2012). A different study reported a positive impact on juvenile lobster, which had greater calcification in acidified water (Ries et al. 2009). The latter study reported the same result for two other crustaceans: blue crab (Callinectes sapidus) and shrimp (Penaeus plebejus). In that study, the consistent positive responses of those three crustaceans to elevated CO2 set them apart from other invertebrates and fishes that responded negatively to acidification. Importantly, both studies may not be relevant to real-world effects of acidification on lobster. The studies were conducted at temperatures above the normal range that the majority of lobsters in New England would encounter for any prolonged period of time. Survival rates of crustaceans exposed to increased CO2 appear to differ among species and among life stages of the same species. Moreover, in some cases individuals of the same species that were sourced from different regions of the ocean exhibited different responses in laboratory studies. In general, crustaceans that are naturally exposed to highly variable levels of calcium carbonate appear less likely to be affected by ocean and coastal acidification (Pansch et al. 2014). For these reasons, it is important to note that effects on crustaceans in the northeastern U.S. may differ from those observed in other regions.